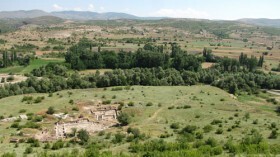 Golemo Gradište is the site of a late Antique city in the eastern Roman province of Dardania, dating from the late 5th and early 6th centuries. This is the point at which urban development moves from Classical to European, with the incorporation of buildings for Christian worship in the urban structure from the outset. Golemo Gradište provides important insights into this phase of change. Excavations on the site to date have revealed a number of structures of interest and importance. Key amongst these is an early Byzantine round church, an exceptional rarity and part of a very small family of known late Classical and early Byzantine structures of this type (such as Santa Costanza in Rome or the earlier incarnation of the Anastasis at the Church of the Holy Sepulchre in Jerusalem, both with funerary associations). 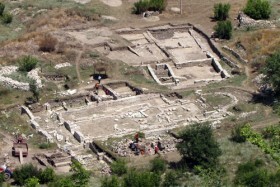 Located in a poor area of the Former Yugoslav Republic of Macedonia, the site is threatened by looters, and heaps of spoil close to their excavation pits are evident throughout. 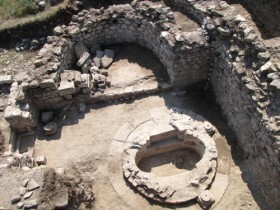 The site is being gradually excavated as part of a formal archaeological investigation supported by Gettysburg College in Pennsylvania, USA, and the Archaeological Museum of Macedonia, but there are no security or site management measures in place. The remains of the round church are decaying apace. The proposal is for emergency protective measures and in the longer term that the archaeological park and its surrounding area, together with the village of Konjuh, are developed to support tourism. The nomination for ‘The 7 Most Endangered’ 2014 was made by the Archaeological Museum of Macedonia.